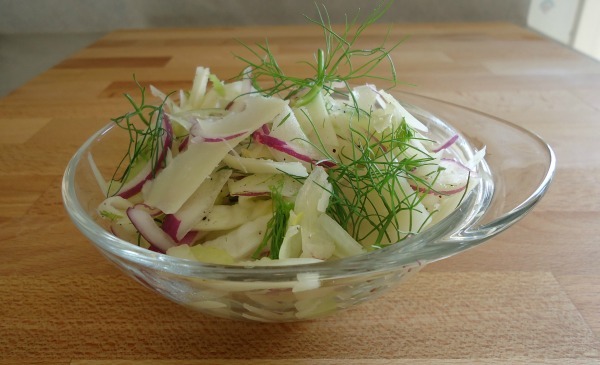 Fennel Salad Recipe is delicious, easy to make and super low in calories. This fennel salad recipe is easy to make and incredibly healthy. 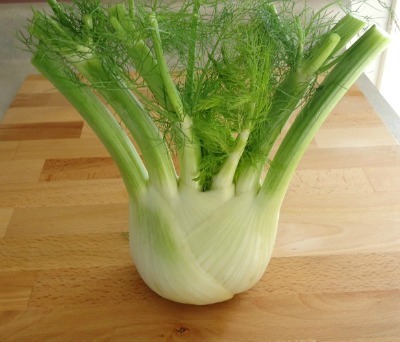 For starters, fennel offers many vitamins and benefits and the ones I particularly like the best is that they provide antioxidants, vitamin c, are high in fiber and low in calories which are qualities we look for when trying to achieve healthy weight loss. We've also included celery which also has an array of vitamins, minerals, nutrients along with a good amount of water content and fiber, now add to it the magical onion which is a liver loving food and you get quite a healthy combination. This diet salad recipe is one of my favorites, not only because it is topped off with parmesan cheese (I love cheese), but because it is crunchy, tangy and offers a mouth watering flavor. Isn’t it nice when you like something that’s good for you? 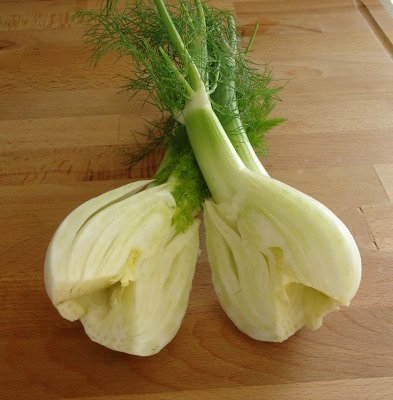 Take the fennel bulbs and trim or thinly cut off the root end. Then remove the outer layer and wash well. Some people like to save this outer layer and use it when making potassium broth, otherwise discard. Cut the bulbs in half and take out the core just as in the picture below. For the time being don’t cut the stalks of the fennel bulb off because they make great handles as you slice the bulb on a mandoline. When only the stalks are left you can remove all the fuzzy green leaves from them (these are called fronds) and use them on the salad as a garnish. Once again you can save the stalks for broth (or discard) as they are too tough to eat. Also use the mandoline to thinly slice the celery and onion. Place all the sliced vegetables into a bowl, add salad dressing, salt and pepper to taste and mix well. Top with a good amount of freshly shaved parmesan cheese. A great way to shave cheese is with a vegetable peeler, works very well. Now you can garnish with the fennel fronds and it’s ready to serve. This fennel salad recipe makes about 4 servings. What a simple diet salad recipe to make and the best thing is that fennel, celery and red onions are readily available throughout the entire year and reasonable in price. So when the winter months come in it’s nice to know that a healthy yet tasty salad is so easily reached.